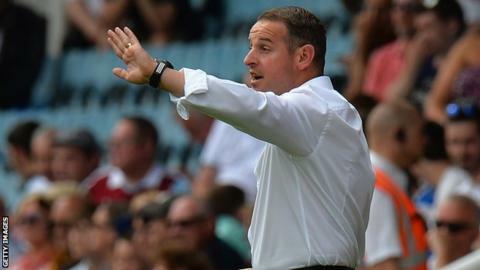 Peterborough United boss Dave Robertson says his experience in the Marines helped him develop management skills. The 41-year-old served as a commando in Belfast and Kuwait before moving into football coaching. "When I was in the Marines I was a leader of men - I think there are lots of attributes that can be called into play when leading a team out," he said. "It helped me formulate my own leadership and management strategies and how I deal with people." Robertson added working as a football manager is the "closest I've come to the camaraderie and togetherness that we experience in the Marines". Robertson was discharged by the Marines after a virus from jungle warfare training scarred his heart, which means he now has to wear a pacemaker or his heart-rate could drop to as low as 33 beats per minute. Following his discharge in 1998, Robertson spent a few years coaching at Crystal Palace before moving to help with the Posh youth system in 2004. He was named caretaker boss after Darren Ferguson's departure in February, and was given full-time charge of the League One club in May on a three-year contract. Robertson has been impressed with the way the Peterborough players handle themselves. "I think people's personal standards tell you a lot about them. Sometimes the little things can tell us as a management team a lot, " Robertson told BBC Radio Cambridgeshire. "But the standards of our players have been absolutely exceptional. All we're doing now is making sure we tinker them. "They can learn from the successes and there have been a lot of positives in pre-season. "We want them to think about getting into the Championship and not only getting there, but sustaining it and moving forwards. It's where we aspire to be as a club and management team."